Revolutions are times like these, when the “formless, inchoate mist” of the Real makes its appearance from behind the facade of everyday normality. Yet they are driven by the desire for normality– a new, transformed normality. They arise when there is a hope and belief that another world is possible. And making sense of them requires stepping outside one’s own normality, which can be more difficult for outsiders than it is for the revolutionaries to step outside theirs. All revolutions have their specificities: ingredients that mix and blend in a simmering stew; conditions that ripen, then converge with events to set off catalyzing tremors and quakes; pivotal moments that shift the system an orbital leap upward, or elsewhere. The conditions behind modern-day revolutions — the Arab Spring, Eastern Europe’s color revolutions, and others — share many of the same features: authoritarian rule, economic distress, political resentment and frustration, and a growing population of youth connected to global society but unable to participate in it as they would like. The shifting moments, too, parallel each other: massive protests, severe crackdowns, murders or martyrdoms (like Mohammed Bouazizi’s self-immolation in Tunisia). It is in the ingredients that we find the greatest differences. In the Muslim world, it has typically been the divide between Islamists — who range from traditionalists (of one stripe or another) to moderates and modernizers — and the liberal center and left that has served as the prominent fault line marking revolutions. The Iranian revolution of 1979 coalesced around a broadly Islamic coalition that accommodated liberal and left-wing strains, only to alienate them in the post-revolutionary era. In Egypt’s revolution of 2011, the conditions (i.e., Mubarak’s rule) managed to bring Islamist and pro-democracy activists together without any real consolidation, and the post-revolutionary government of Mohammed Morsi utterly failed at the latter task — which has led to the current, seemingly insurmountable (and violent) stalemate. In Eastern Europe, the terms have been somewhat different: religion’s role has been muted, and Soviet rule left behind a cultural and political legacy that has impacted the social fabric in substantially different ways. But in Ukraine, like in Egypt or (earlier) Iran, the corrupt and authoritarian governance of a president and his clan has managed to unify groups across the political spectrum — and much of the religious and cultural spectrum — in opposition to it. Even so, it’s difficult to map that spectrum out against western notions of what’s “right” and what’s “left.” In what follows, I’ll try to do that while noting some of the distinctive features of this revolution, as well as some of the troubling issues that remain for it. What’s most clear in Ukraine is that Yanukovych’s U-turn on negotiating a deal with the European Union surprised and disappointed many people. Some of them went out to protest, and stayed — in large numbers and cold temperatures. Uncomfortable with the size of this protest, the government hardened — it set some riot police after the protestors, injured some (and eventually killed a few), and passed an array of draconian laws intended to make protest of any sort illegal. None of this dispirited the protestors; instead, it strengthened them. Among the protestors — the vast majority of whom had been gathering and demonstrating nonviolently in increasingly cold weather for weeks — there emerged some who were frustrated and/or motivated enough to begin resorting to more radical measures. These were quickly labeled “extremists” and “far right nationalists” (and it didn’t help that among them was a group that went public under the name “Right Sector”). But where in the past the mainstream would have quickly disassociated from them, this time it didn’t. It understood their frustration; it shared it. As with the Orange Revolution of 2004, but perhaps more maturely — both in terms of social media use and in terms of how widely disseminated it is now across the country — the revolutionaries have made extensive and innovative use of the internet. Oppositionist media are available in many of the country’s larger urban areas, but not so much in the Eastern industrial belt, where Yanukovych’s power base resides. National media tend to be controlled by the government or its cronies. But activists across the country are online. Additionally, they came up with a series of innovative strategies, including the Automaidan — car convoys that blockaded roads to slow the arrival of trucks carrying riot police, or that blocked the exit of president Yanukovych from his exurban mansion, the burning of rubber tires to provide a smokescreen for protestors, musical performances in front of riot police by masked protestors, and more. The geographic dimension of the revolution has been critical. 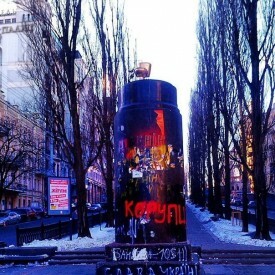 Kyiv (Kiev), being the capital, has been the leader, and Independence Square (Maidan Nezalezhnosti) has been the heart and center of the movement. Where tens and sometimes hundreds of thousands have gathered at the Maidan, the more radical elements have dispersed outward from there, with more violent confrontations taking place on nearby Hrushevskoho Street. But activists are all over the country, and when they started taking over government buildings in the provinces and convincing police units to defend “the people” rather than the government, Yanukovych was forced to take notice. It’s agreed by many that those events precipitated the latter’s offer of more serious negotiations, including the proposal to offer senior government positions to two of the opposition party leaders. In some places, activists have organized parallel local governments and volunteer self-defense units. 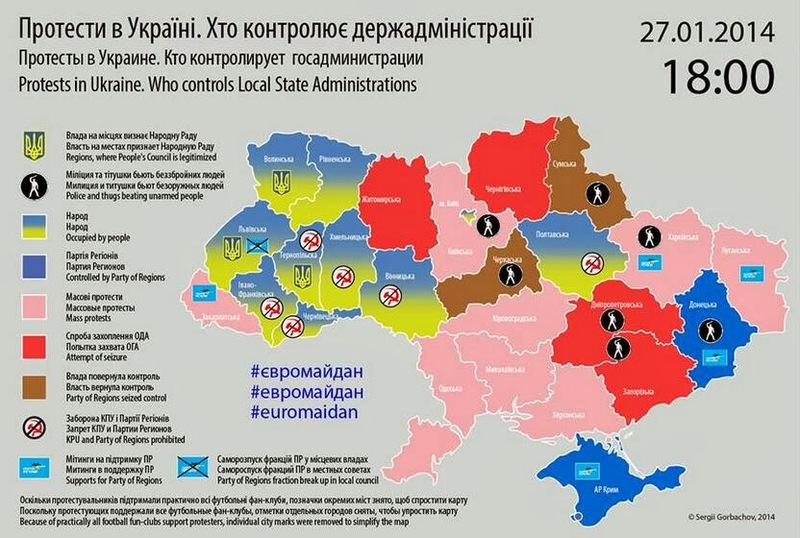 One of the memes that has circulated most rapidly among oppositionists and their supporters are maps of the country indicating which state (oblast’) houses are now in the hands of the opposition, which are still contested — and which ones have seen opposition support coming from clubs of local football (soccer) fanatics. Western media treatments have frequently depicted the opposition as led or dominated by right-wing nationalists or extremists. As scholars of far right, xenophobic, and anti-Semitic groups have pointed out, these characterizations are misleading. They are, in fact, repetitions of talking points dreamed up by Russian “Eurasianists” and the Kremlin’s “political technologists.” More on that in a moment. Ukraine’s opposition includes the full spectrum of political opinion: from the nationalist right to the moderate and liberal center to the radical left. The right has received more media play (more on that, too, in a moment), but the left includes socialists and Left Oppositionists, trade unionists, anarcho-syndicalists, ecoanarchists, feminists and LGBT activists, and others. As Yuliana Lizer and Pavel Nikulin show in their overview of Ukraine’s left-wing organizations, only the Communist Party of Ukraine — denounced by most leftists as a “political-technological fake” — and the Marxist euroskeptical group Borot’ba have remained opposed to the Euromaidan. To their list can be added the signatories of a recent letter that has all the hallmarks of “political technology” — signatories like Natalia Vitrenko, leader of something called the Progressive Socialist Party, and the members of various Eurasianist groups, whose overarching goal is to reconstitute a culturally conservative brand of Russian hegemony across Eastern Europe and northern and central Asia. Influential in Putin’s inner circles, neo-Eurasianist ideologues like Aleksandr Dugin have deep links with the European New Right of Alain de Benoist and others, which makes their accusations of “fascism” more than a little ironic to anyone familiar with their views. The sense that “everyone else has been allowed to rule themselves, why can’t we?” is a palpable sentiment among many Euromaidan activists. To be fair to their critics, they have had elections, and at least one of their presidents, Yushchenko, was a favorite of the western-style democracy advocates. But Yanukovych is the anti-Yushchenko, perceived by many oppositionists to be a petty criminal in cahoots with a foreign regime. In a society of the spectacle, everything is upfront — the spectacle is the constant flow of images by which the world is “always already” made sense of, its options reduced to a few pre-selected choices among politicians (or hamburgers) that diverge very little in substance, only in image. The critical question is whether there is anything of substance behind the precession of simulacra — that is, aside from the PR firms and spinmeisters who act as the wizard behind the screen. In a society of the provocation, there is also spectacle — from May Day parades with their muscular displays of Soviet military might, to Yeltsin’s triumphant jump atop a tank in front of the Russian White House, to cults of personality from Stalin to Putin. 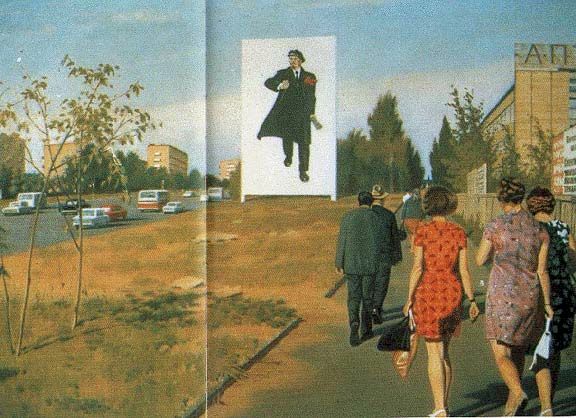 But everyone knows what’s behind that spectacle: Soviet (or post-Soviet) power. And at the same time, no one knows, since the real power-dealing occurs behind closed doors, where everyone can be a spy or a counter-spy, and where gossip and vodka-fueled intimacy are the main styles of accommodation. Aside from the spectacle of power, however, there are always provocations occurring on the sidelines and in the shadows. Technically, a provocation is a kind of chess move: an act intended to provoke a reaction, with the goal of setting up a causal sequence that’s almost scientifically predictable, in its being rooted in human response mechanisms. But it’s never clear whether or not something was a provocation, or perhaps a meta-provocation — a provocation intended to look like a provocation, so that the provoker might have been the one you’d think would benefit from the act, or it might have been the one who’d benefit from the unmasking of the one who’d more obviously benefit. And the layers of the onion grow from there. But videos from before and after the event show some of the supposed “nationalist hotheads” milling about with the police, and eyewitnesses reported Dmytro Korchynsky — a former nationalist activist who’s widely believed to be an agent provocateur, on the payroll of pro-Russian oligarch and Putin ally Viktor Medvedchuk — leading the bulldozer brigade. Maidan activists claim that it was a provocation intended to legitimize a further police crackdown. And, indeed, the ones who got most bloodied were Maidan activists unrelated to Korchynky’s group (one of them was a former leader of the popular rock band Okean Elzy). So what was the provocation? 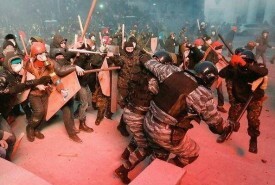 Did Maidan activists get violent and rough up the hapless riot police (as the government claimed)? Did provocateurs do that in an attempt to discredit the Maidan activists, showing them up to be explosive and dangerous extremists (as many in the opposition believe)? More sinisterly — since the police made no secret that Korchynsky may have been involved — did provocateurs do that in order to send the message to activists that they, too, risk getting their heads bashed in? Working our way backwards, was the first police crackdown intended to trigger exactly this kind of reaction among the activists — but since it didn’t, it had to be staged? Not all of these interpretations are as plausible as others, but the point is that the events seem intended to generate interpretations — powerful ones, contradictory ones — and reactions. The society of the provocation is a society in which intentions are blurred and multiplied, conspiratorial gossip is magnified, and ambiguity — a kind of “dirty” version of Zizek’s formless, inchoate mist — grows. The opposition is not immune to that mist. But somewhere in there are efforts to bring an unusual clarity. The sign above — “COUNTRY UNDER RECONSTRUCTION. SORRY FOR THE INCONVENIENCE.” — is simple, direct, and, in its ambiguity, rather profound. But people don’t spend their winter in tents on the streets of a cold capital for geopolitical reasons (or for cash allegedly disbursed by geopolitical masters; it’s notable that those who do, the so-called “titushky,” don’t stick around for long). They do it for faith in a clarity that exceeds the misty greyness of a world they aren’t willing to accept anymore. That clarity may be ideologically tinged (left or right), but, for most of the Maidan activists, ideology is besides the point. They’ve had enough of the society of provocations, of gossip, and of cronyism, and they believe that another world just may be possible. I’m trying to get up to speed on what’s happening in the Ukraine. I would like to see some critical analysis on the role of U.S. Imperialism and the CIA in these unfolding events. 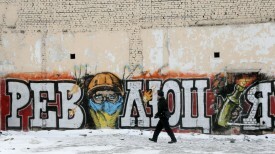 What I have heard out of the Ukraine opposition seems at best to reflect a naivete about the nature of the West. For me, the question is not liberal “democracy” but how to get to revolutionary socialism, which the U.S. and its Western allies have always been the world’s main enemy of. Ukrainians have already had a long experience of what they were told was revolutionary socialism, and few of them have any more appetite for it. Of course, it was really a form of imperialist and authoritarian “socialism”-from-above, a divided society where one class ruled over the rest. There are many in the opposition who would favor a European-style social democracy, and some who are more radical (anarchists and anti-authoritarian socialists), though the latter are relatively marginal in the opposition (or anywhere else). But most Ukrainians are just interested in something much more basic: respect for their rights, transparency, the rule of law, and the end of kleptocracy, which really robs the whole country economically. They also realize that the West doesn’t care enough about them (certainly at this point in time) and that they have to act on their own. There are web sites where you can read about the role of U.S. imperialism in Ukraine (like Michael Chossudovsky’s Globalresearch.ca), but they get a lot of their information from sources that can ultimately be traced to Russian neo-Eurasianists, who support Putin’s geopolitical project for a Russian-dominated Eurasian counterweight to the West. That project is socially very conservative (note the anti-gay laws, etc. ), politically authoritarian, and very far from what you or I would consider to be socialism. I could share some sources with you on that, if you’d like, but I’ve linked to some of them before on this blog and on UKR-TAZ. Putin’s ideologues are very good at propagandizing against Ukraine — they have a long and successful history of it (Putin was groomed in the KGB, as I’m sure you know) — and so they decry the “Ukrainian fascists” right now, even though they work with their own fascists (and, in some cases, are their own fascists) when it suits them. I try to follow the independent left in Ukraine, and from what I can tell, they are as incensed by Yanukovych’s authoritarian crackdown against the opposition as anyone. Many of them are actively involved in the opposition. But they are a varied lot, and for historical reasons (as I’ve pointed out above), the independent left — by which I mean a left that is not beholden to the corrupt powers that be (Yanukovych’s Party of Regions, their Communist Party lackeys, or the pro-Russian Eurasianists like Natalia Vitrenko) — is not a significant player in the country right now. What is, is a broad movement to change the system, firstly by bringing it back to being a parliamentary constitutional democracy (rather than the presidential rule Yanukovych has turned it into), then deepening the democratic nature of that to make it more accountable (so that politicians and parties cannot be bought out), and make it possible to have real political options. In some ways, all of that is not very different from the surface problems with the U.S. political system. But taking it to the streets is more than Americans seem to be able to do. 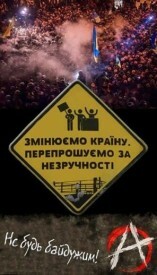 We can learn a lot from Ukrainians in that. Adrian – Thanks for your response. However, you have not convinced me so far that what’s happening in the Ukraine right now is a movement worthy of the support of anti-capitalist revolutionaries. Apart from likely U.S./EU manipulation behind the scenes and apart from a significant and very ugly ethnic chauvinist and even neo-nazi component, the backers of the movement seem all-too-eager to embrace Western-style consumerist capitalism and bourgeois “democracy.” Can’t anybody in Eastern Europe learn from what has happened during the last 30 years to the economic safety-net that existed under the admittedly limited and state centralist form of socialism that previously existed? The 1% now rules over the 99% with a vengeance. I am also troubled by something else I find in your response: When you use the term, “Ukrainian,” are you referring to an ethnicity or to citizens of a nation-state? If it’s the latter, the Ukraine has many citizens who are of Russian, Byelorussian, Jewish and other ethnicities who are not necessarily supportive of this movement and who seem rightly fearful that their liberties and interests will not be protected when this movement comes to power. This movement does not even seem to be a movement at all of the whole nation against the authoritarianism and “kleptocracy” of the current regime. It seems much more based around one particular ethnicity, an ethnicity I might add which has a lot of apologize for from its sordid past as collaborators with the Nazis in the Second World War. How do you deal with that fact? Jay – It wasn’t my intent to convince you that what’s happening in Ukraine is “worthy of the support of anti-capitalist revolutionaries.” But if anti-capitalist revolutionaries see any overlap between their goals and processes of radical, grassroots, direct democracy, then I think there are many things worth supporting in what’s happening in Ukraine. By the same token, if they don’t, then there probably isn’t. You say you’re troubled by something else you find in my response, but you don’t tell me what it is. You follow that immediately with a question that begins, “When you use the term, “Ukrainian,” are you referring to an ethnicity or to citizens of a nation-state?” The answer to that is simple: I refer to citizens of a nation-state called Ukraine, whose citizens are Ukrainians. I use the term “Ukrainians” four times above (in the article itself or in my reply to you), and “Ukrainian” an additional four times, and nowhere is there any implication that I’m restricting it to those who consider themselves “ethnically” Ukrainian. So I can’t help concluding that you’re troubled by something that’s not in my response, but that you nevertheless “find” there. Since it’s not there, I don’t feel it’s my responsibility to account for it. But could it be that calling someone “Ukrainian” is different to you than calling someone “American,” “Canadian,” “Russian,” or anything else? 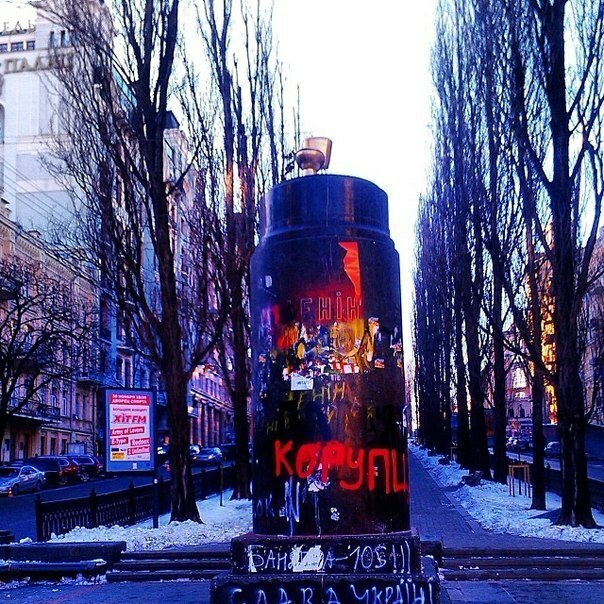 Accounts of the Maidan movement are pretty clear that there are Russians, Armenians, Georgians, Jews, and others, both among the activists and even (in some cases) among the murdered or injured victims. (Whether these are ethnic Russians (et al.) or Russian (et al.) citizens isn’t clear in most accounts. 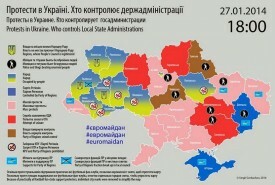 But it’s pretty clear that it’s not just ethnic Ukrainians. To claim that Ukrainians as a whole collaborated with the Nazis is absurd: many Ukrainians at the time fought against the Nazis, and many were and remained anti-fascist. Most Ukrainians were never fascists. When the country was torn between Soviet, Nazi, and (in some places) Ukrainian partisan forces — and it was never the entire country that was — people were forced to collaborate with someone or be prepared to forfeit their lives. Naturally, some collaborated with the Soviets (against the Nazis and sometimes against Ukrainians and others), some with the Nazis (against the Soviets and sometimes against Ukrainians and others, most obviously Jews but Poles as well), and some tried to steer clear of both but supported or became active with the Ukrainian partisans. Some of the latter group collaborated with the Nazis at times as well. I won’t defend any of them. So, in summary, how I deal with the “fact” that “one particular ethnicity” has a lot to apologize for from its sordid past is to ask you the same question. I don’t know what ethnicity you affiliate with, but should I judge you by the worst things that members of that ethnic affiliation have ever done? I think not. Maybe we’re just different that way. I spend a lot of my time apologizing and trying to make amends for what my own ethnicity (Caucasian or Anglo) has done to Native Americans and African-Americans. Some of my own southern ancestors were slave-owners. The Germans at least have made some serious efforts to come to grips with their Nazis past. I don’t mean to say that all members of your Ukrainian ethnicity collaborated with the Nazis. But many certainly did, and it seems to me that, because that history has not been dealt with fully, there’s a continuity with the ugly stuff happening in your country right now such as that described in this article that I found oday in the left press: http://www.alternet.org/tea-party-and-right/us-backing-neo-nazis-ukraine?akid=11539.259473.ytBBHB&rd=1&src=newsletter962461&t=6. The Ukrainians described in this article are promoting a “pure” Ukrainian ethnicity or nationality. One further point I would make: You seem to be equating collaborating with the Nazis with supporting the Soviet Union. These were two very different things. One advocated German national and Aryan racial supremacy. The other, however fallibly, advocated for working-class internationalism and the abolition of class, racial and sexual oppression. Great article! I think knowing history is one of the key-stone for a longterm peace. Unfortunatly, most of the time, we need disasters like what’s happening in Ukraine to pimpup our curiosity. This conflict has evolved alot in the past few months…. It is hard to have a clean opinion about this conflict and we are witnessing massive propaganda from both sides. Economy and innocent lives will be ruined for decades… This will be used to enslave the region with economic dept, mostly like we are already in the west… 🙁 Forbes contributor Mark Adomanis explained to HuffPost that unless Ukraine receives significantly more aid from either the International Monetary Fund (IMF) or the European Union to upkeep its military operations in the East of the country, the government will run out of resources “in the very near future.” If you look at the amount of assistance that Ukraine has actually received from both the United States and the Europeans, it’s been pretty paltry amounts. It’s a few billion here and there, and Ukraine’s funding needs are, at a minimum, somewhere between $15 and $20 billion! It reminds me alot WW2….